So, today I’m walking down the long, narrow aisle that separates one side of the building into halves. Quarters, to be precise, considering there are two halves to the building, each roughly split down the middle. It’s a long row of printers, faxes, mailboxes, sharp cutting tools, hole punches, recycle bins, more printers, and supplies of envelopes and forms. That’s exactly what I do because my brain registers that yellow cover; it’s in my library at home. 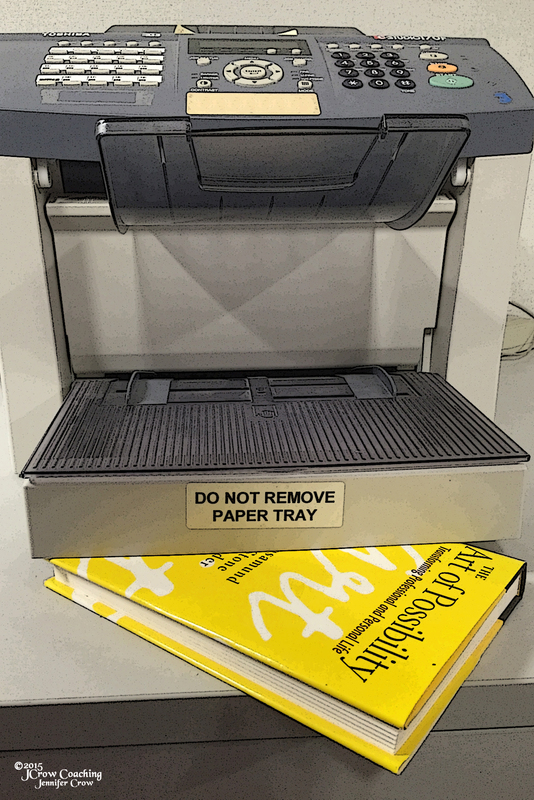 I retrace my steps, reaching down to pull the book toward me – but only so far, because I don’t want to completely dislodge the obviously essential item from its task of supporting that sagging tray. It’s The Art of Possibility, a book by the Zanders: Rosamund (a psychotherapist) and her husband Benjamin (the conductor of the Boston Philharmonic). The thought-provoking treatise offers tips for turning life’s obstacles into possibilities and looking at problems from new perspectives. The fax machine won’t work because the paper tray sags and won’t feed the machine, the repairman can’t get here for a week and we have dozens of faxes we need to send, and dozens more we expect – and that’s just for today. What should we do? How can we possibly fix this? Oh, look. Here’s a book that’s the perfect thickness. Let’s put it underneath. Hey, look! It bolsters the sagging tray, which allows the machine to pull the paper through, which lets us continue working, which helps us get our jobs done on time. What’s possible, you ask? Why, creative problem solving! Grateful today for the art of possibility.